Impossible is Nothing: Some days you just have to say WOW! It just can't get any better! We are all feeling very privileged to be here visiting incredible schools and meeting the most inspirational people. After 3 days and 6 schools there are some definite 'themes' that make these schools so successful and I'm not just talking e-Learning. The opportunities we have seen for student learning and engagement have been amazing. The leaders we have met have had many things in common including a shared vision, passion, energy, spark and a complete understanding of the importance of personalised learning for students. Technology has just been one of the tools in this journey. 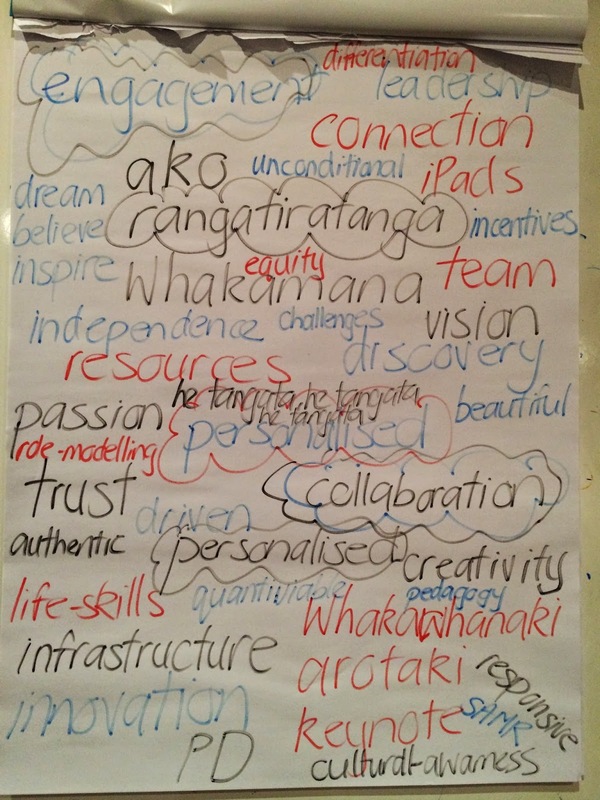 We joined together for a hui back at our Hotel today and had time to reflect and discuss as a team. Our first challenge was to come up with just 3 words to sum up our school visits to date... 3 days, 6 schools, 17 participants - CHALLENGE ON! Today we had the pleasure of visiting Warringa Park School and Manor Lakes P-12 College, and as with the other 4 schools we have visited, writing words in a blog post cannot do them justice. So, just a few notes to encourage you to join us on our next trip! Colin Schot, Principal @ Warringa Park introduces the school and the context of it perfectly on their website. It is a pleasure to introduce you to our school. Warringa Park is a dual mode school which caters for all children with an intellectual disability and has a current enrolment of 431 students. Warringa Park School is committed to assisting our students to be the best they can be in all that they do. Students are at the centre of all learning and we strive to ensure that they have the best facilities, resources, teachers and education support staff to enable them to learn and grow into responsible citizens. We had the pleasure of seeing this for our own eyes - students engaged in learning, endless opportunities and support to be the best they can be. Colin, Laura and Brian shared their stories and knowledge with us and discussed the positive impact 1-1 iPads had had for these students. We could have stayed and played all day in this environment - from musical gardens and vege gardens to media rooms, tv stations and magic carpets - we were enthralled. Our morning ended with morning tea in the student led Cafe - what a amazing hosts who are developing life skills in an authentic environment. These kids knew how to roll! Daz summed it up perfectly in her mihi - this school is creating MAGIC and we could feel the aroha and warmth from the gate. Thanks for an incredible morning Warringa Park! The team at Manor Lakes were again passionate and inspirational. The vision of Manor Lakes DREAM, BELIEVE, INSPIRE greeted us as we walked through the door and followed us throughout our tour. What struck us most at this school was the incredible mutual high trust between students and teachers as well as the value placed on relationships. We could feel and see the vision in action. We were fortunate to have the opportunity to hear a fellow NZ'er, working at Manor Lakes, explain their Positive Behaviour Support (PBS) programme which focuses on creating the vibrant harmonious community at Manor Lake. You can check out more about this programme on the school website. 72 babies a week a born in the area! Try and keep up with that! As I said, some days you just have to say WOW! My 3 words today were 'He Tangata, he tangata, he tangata' - we have met so many special people over the last 3 days who have inspired us!